If I had to sum up “Amazing Gracie” with just one word it would be ‘Amazing’. I was drawn to the book by a cute puppy on the cover. 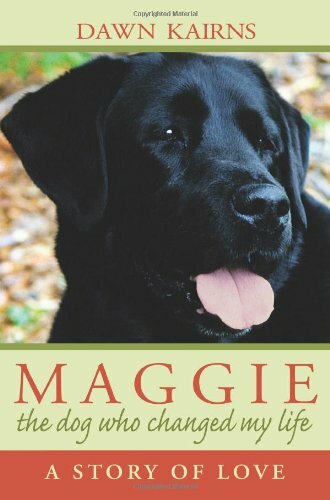 I expected it to be a story about a special dog who touched someone’s life in a special way, but it was much more than that. I also didn’t know this dog was famous. She is known nationally but her home was in the Kansas City area – close to where I live. I have even been to the store named her honor, never knowing the legacy which lay behind it. Gracie was a Great Dane, born deaf and partially blind. She would have been put to sleep by the backyard breeder if Anne hadn’t introduced her to her friend Dan Dye. Gracie filled a hole in Dan’s heart, but in the long run she did so much more than that. In chapter 3 we hear a hilarious story about how Gracie got her name (police were involved). 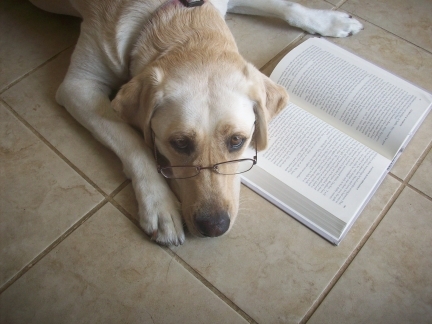 In chapter 6 we read about how Gracie was not so well received by Dottie and Sarah, two other dogs in the household. But not to worry, that was only at first when Gracie was a puppy. The relationship between the three sisters grew. In chapter 8 we learn that it was Gracie’s sensitive stomach which ultimately inspired a chain of stores which sell the bested darned dog treats around. This chain of stores is where Gracie’s fame is founded. You see, when Dan learned that Gracie had a sensitive stomach he learned to cook for her. He used natural and healthy ingredients with none of the preservatives or fillers which most dog foods today use. From there, Dan and his good friend Mark began a small business of selling this food in the form of dog treats. It was a home-based business at first, but it grew over time. Eventually they had to get a store front and the Three Dog Bakery was born (named from Dottie, Sarah, and Gracie). But the growth didn’t stop there. The Three Dog Bakery is now a chain. Dan, Mark, and the girls have even been on Oprah! You can’t get more famous than that. And to think that it all started with a deaf dog with a sensitive stomach who would have otherwise been put to sleep for her supposed imperfections. Almost as amazing as Gracie’s story is Dan and Mark’s writing style. “Amazing Gracie” is funny, heartwarming, and personable. If I had had the time, I would have read it in a day. But as it is, I have a full time job and part time job so it took me three nights instead. I read it in a short amount of time but Gracie’s story will stay with me forever. 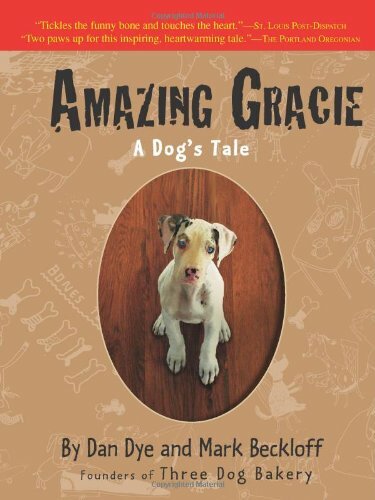 You can purchase “Amazing Gracie” for yourself at the Dog Lover’s Bookstore which is affiliated with Amazon.com. After you read “Amazing Gracie” by Dan Dye and Mark Beckloff, visit the Three Dog Bakery nearest you. Check out this new adorable video with Dexter from Dexter’s Ruff Life. Sephi is not too happy about wearing those bunny ears. But she still looks cute. 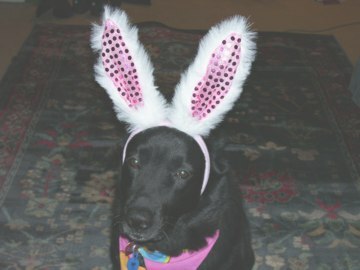 She may have hated her picture but she couldn’t help but to laugh at Maya wearing her bunny ears. Check out Maya’s photo at www.PetAutoSafetyBlog.com. 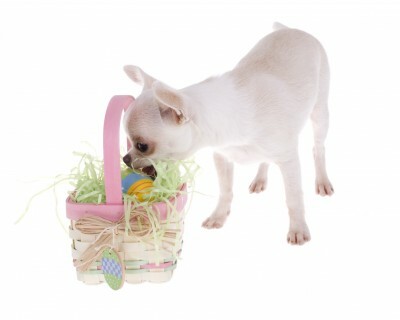 Be careful of your dog eating hard boiled eggs as well. While the eggs and the egg shells may be relatively harmless, there is a danger of choking. This applies to the plastic eggs with hidden goodies as well. If your dog happens to eat a hard-boiled egg with its shell without choking on it, he is probably okay. But it wouldn’t hurt to contact your vet just to make sure. However, if your dog eats a plastic egg without choking, get your dog to the vet immediately as an object of this size is very likely to cause blockage in your dog’s intestinal tract. I wish I had a good photo of the Grand or Petit Bleu do Gascogne, but with copyright issues, I couldn’t use one from another site without permission. So picture the Black and Tan Coonhound with blue ticking coloring on the lower body. You can see a good photo at http://en.wikipedia.org/wiki/Petit_Bleu_de_Gascogne. Ancient France was well known for their development of the scenthounds. Many scenthound dog breeds today have origins in France. 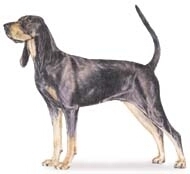 One such French scenthound is the Grand and Petit Bleu de Gascogne. Gascogne is Gascony and these dogs are also known as the Large Blue Gascony Hound and the Small Blue Gascony Hound. The Grand Bleu de Gascogne stand about 24-28 inches tall and weighs 71-77 pounds while the Petit Bleu de Gascogne stands only slightly shorter at 20-23 inches tall and weighs 40-48 pounds. The Grand and Petit Bleu de Gascogne are used almost exclusively as trail-hunting gundogs. The Grand Bleu de Gascogne was used in earlier times for hunting deer, wild boar, and wolves while the Petit Bleu de Gascogne was used for hunting rabbits. The Grande and Petit Bleu de Gascogne dog breeds are generally easy to train for the hunt and work well with other dogs in packs. We obtained the information on the Grand and Petit Bleu de Gascogne from Wikipedia and “The New Encyclopedia of the Dog” by Bruce Fogle. This book and other great dog books are available at our Dog Lover’s Bookstore through Amazon. Does My Dog Sephi Have a Sixth Sense? How many of you have had a dog who seemed to have a sense about certain people or were in tuned to your emotions? And he seemed to know these things without any obvious visual, audible, or odorous indications? For example, my dog Smokey seemed to have a sense for bad people and would warn me of them accordingly. The first time was when we were at the vet. Smokey didn’t like the vet office, but he had never shown any aggression towards the staff. But one day, there was a particular man there behind the counter. He was a delivery man or something and was joking with one of the vet techs. It was obvious he belonged there. He was wearing ordinary clothes and there was nothing in his voice or body language which signaled anything to me. But Smokey didn’t like him for some reason. Smokey ever so gently raised himself up and put his paws on my chest, looked directly at this man, and gave a low but menacing growl. Smokey was obviously protecting me. He never jumps on me and I was startled by the gesture. What was it about this man that he didn’t like? I never found out but since it was such an unusual behavior I never questioned his opinion. Another time some teens came to my door selling stuff. I lived in an apartment in an okay neighborhood so this sort of thing happened all the time. There was nothing unusual about people visiting and although Smokey was curious, he generally didn’t care. But then one of the teens asked me if they could use my restroom. It was an unusual request and my guard went up. Without thinking I said, “Sure, if you think the dog will let you come in.” The teen responded by talking to Smokey in a sweet voice and tentatively putting his hand out for Smokey to sniff. Smokey’s hackles went up and he growled menacingly with bared teeth. Well, that settled that! I was so proud of Smokey. I had put all my faith into Smokey and he came through with flying colors. Did he read me and my reaction to these teens who were asking to come into my home? Or did he read their intentions somehow? Smokey is gone now, but now there is Sephi. Sephi was not good at reading people when she was younger, but in her older and more wiser age, she has shown signs of having a sixth sense. One time, a new maintenance guy came into my apartment when I wasn’t home in order to make some requested repairs. Apparently, as I found out later, the maintenance guy didn’t even know I had a dog until the repairs were done and he saw her laying on her doggy bed when he was on his way out. It surprised him because she never barked or never went to greet him or see what he was doing. It was like she didn’t even care he was there. But in another instance she cared a great deal. I came home early from work because I was sick. In my foggy state of mind, I forgot to lock my door before I went to lie down in the back bedroom. Sometime during my half-sleep I heard my door open then a man’s voice. Sephi went nuts. I have never heard her bark so viciously in her life. I wouldn’t even call it a bark. It was more like a snarling madness. Whoever this man was, he left so quickly that I never saw even a glimpse of him. Sephi saved me that day. How did she know to scare this man off but let the strange maintenance man in? Was it because the maintenance person knocked first? Was it because I was home and she was protecting me? Or was there something more? On the lighter side, how does Sephi know when I am thinking of taking her for a walk or for a car ride? Before I even grab for the leash or her dog car seat belt, she somehow knows what I am thinking. Since I put on my shoes and go somewhere all the time, how is it that she is able to tell that this is the time that she gets to go? When I worked from home, it couldn’t have been the time of day because I had no set time. And car rides were even less frequent. But if I am seriously thinking about a walk or for going to the drive-through teller at the bank, she somehow knows and starts prancing around me, making her little happy doggy growls, and wagging her tail excitedly. Dawn Kairns, author of “Maggie, the Dog Who Changed My Life“, seems to think that her dog Maggie had a sixth sense – That somehow, certain dogs are so in tuned with their owner that they can sense our thoughts, understand our intentions, and possibly influence our dreams. The dream part is a little bit of a stretch for me, but I have no doubts that Smokey and Sephi just “knew”. It could have been that certain people smelled different when they were up to no good. Or perhaps Smokey and Sephi observed a certain body language which I was unaware of. But whether it is a sixth sense or an ordinary sense, it is still amazing. And if my dog doesn’t like someone, I do not question it. Do you think some dogs have a sixth sense? Have you ever had a dog do anything like what Smokey or Sephi had done? The Poodle dog breed comes in three sizes – toy, miniature, and standard. The Toy Poodle dog breed is classified under theToy Dog Breeds of the American Kennel Club (AKC) while the miniature and standard Poodle dog breed is classified under the Non-Sporting Dog Breeds. Although different in size, everything else about the three Poodle dog breed varieties is relatively the same. The Poodle dog breed originated in Germany. He was bred to be a water retriever and later as a performer. When the Poodle dog breed was used as a water retriever, his hair was cut in a certain working pattern which allowed for better swimming as well as protection against the cold water. His hair was left long on the chest, joints, and tail tip while the rest was shaved. The Poodle dog breed is intelligent and very responsive to training. As such, he became popular in France as a performing circus dog. In France, his breed was developed further into the various sizes you see today. The Poodle dog breed is called Pudel in Germany and Caniche, meaning Duck Dog, in France. Even though he is still used as a retriever is some remote parts of the world, today he is bred more as a companion dog – so much so that he is not part of the AKC Sporting Dog Breed Group. The Poodle dog breed has a harsh curly long coat which can be any solid color. This coat does not shed but grows continuously and requires constant clipping. He has oval eyes, a long thin muzzle, and low set ears which hang close to the head. The tail of the Poodle dog breed is straight, carried upward, and docked. He has a wide and deep chest and sturdy legs with small oval feet. The Toy Poodle dog breed stands under 10 inches and should weigh about 4 to 6 pounds. The Miniature Poodle dog breed stands about 10 to 15 inches tall and weighs about 12 to 18 pounds. And the Standard Poodle dog breed stands over 15 inches tall and should weigh between 45 and 70 pounds. The Poodle dog breed is very playful and rather energetic. He needs daily physical exercise, nice long walks for the larger variety. The Poodle dog breed is also very intelligent so mental exercise is needed as well. Without enough mental exercise, he is likely to develop bad behavior problems such as chewing in order to keep from being bored. The intelligence combined with his amiable nature makes the Poodle dog breed easy to train. He can be sensitive to harsh training and harsh training isn’t really needed with this obedient and eager to please dog breed. Although the Poodle dog breed tends to be devoted to one person, he is good with other pets and does well with children. As with most purebred dog breeds, the Poodle dog breed is inclined to develop certain inherited health problems. He can develop eyelid problems and/or a disease called progressive retinal atrophy which could lead to blindness. He can develop skeletal problems such as patellar luxation or Legg-Perthes disease. Patellar luxation is problems with the knee cap which can lead to lameness. Legg-Perthes disease is problems with the femur bone which can lead to hip problems. The Poodle dog breed is also inclined to have neural issues such as epilepsy which results in periodic seizures. The Standard Poodle dog breed is specifically inclined to develop a genetic skin disorder called sebaceous adenitis. If you are interested in adding a Poodle dog breed into your family, consider adopting or purchasing from a reputable dog breeder. A dog purchased from a reputable dog breeder may be more expensive but he will be less likely to develop certain health issues. A reputable breeder will most likely be a member of the Poodle Club of America and will have had the dogs tested for certain health issues. 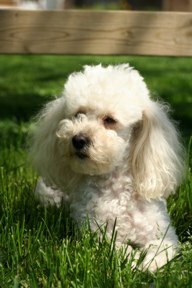 The Poodle dog breed in any size is great for just about every family. The smaller variety may not do as well around smaller children and he may tend to bark a lot. Anyone with other pets should have little trouble in integrating this adorable dog into the family. And the fact that the Poodle dog breed doesn’t shed is a plus for people concerned with dog allergies. To teach your dog not to dig can be easy for some owners and dogs but very difficult for others. 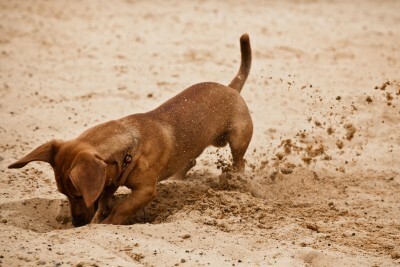 It all has to do with why your dog is digging. Dogs dig for many reasons including boredom, separation anxiety, to cool down, to escape, or it is a genetic trait (instinct). In order to find the best way to keep your dog from digging, you must first determine for which reason your dog is digging. My dog Maya is three-and-a-half and has just recently picked up a new habit of digging. She is probably digging for several reasons including boredom, instinct, and because it is just plain fun. She seems to dig along the fence line but she is not trying to dig deep enough to escape so I can only assume that she is digging because she has caught a scent of an animal on the other side. One of my neighbors on the other side of the fence has a dog while the other two neighbors don’t. But they have wild rabbits. Rabbits don’t come into my yard because of the dogs but I see them in the neighbors’ yards all the time. If your dog is digging out of boredom, the simplest solution is to keep your dog from being bored. Make sure he has a few interesting toys to play with. Rotate the toys every few weeks so that he doesn’t get bored with his toys. Make sure he gets plenty of exercise. Take him for walks or play fetch. Play fetch with him until he is tired, then hopefully he will be too tired to dig. If your dog is digging from separation anxiety, try to help him learn that the yard is a fun place to be, even if you are not there. Leave his favorite toys out there for him to play with. You will also need to practice leaving your dog in the yard for short periods. Leave him outside for short periods before he begins to dig then go outside and play with or pet him. Do it again and again, gradually extending the time that he is outside by himself. This graduation should take several weeks or even months depending on your dog’s level of anxiety and your dedication. If your dog is digging to cool down, make sure he has access to plenty of cool water. 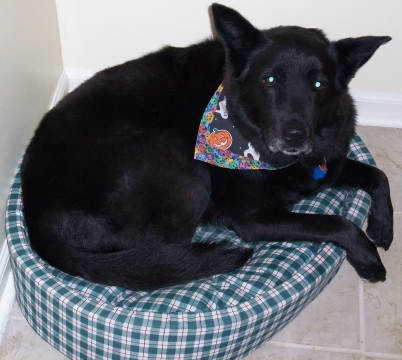 You can also give him a shallow pool to lie in and/or a shaded dog house. If your dog is digging to escape, try to determine why he wants to escape. Does he like to roam, is he bored, does he smell something he wants? If he is digging because something interesting has caught his scent, you may want to consider getting him neutered (or spayed if she is a girl). This may help keep curb your dog’s instinct a bit. Also keep more interesting things in the yard so that he is less inclined to leave. Make the yard a fun place to be. As with boredom above, rotate his toys and play with him frequently. And most importantly, never use the backyard as a form of punishment. The yard should be a place of enjoyment, not a place to go when he is bad. A dog digging to escape may be doing it out of instinct as well. If you don’t catch your dog in the act of digging, don’t punish him after-the-fact. It does no good and he may learn that being in the back yard is a bad place to be and you may encourage other bad behaviors by mistake. If you notice the holes afterward, fill them back up. You should bury holes with something that will annoy or deter your dog from digging there again. Experiment with burying his feces in the hole, rocks, or chicken wire. You can also spray the area with a pet deterrent spray. You will may need to spray regularly depending on the product. If you catch your dog in the act, use a startle technique to get them to stop. Make a shaker can, high powered squirt bottle, or shriek alarm. The key to this, however, is to not let your dog see you shake the can, squirt the bottle, or sound the alarm. If he sees you, he may simply just learn not to dig when you are around. The other key to the startle technique is to be consistent. Always make sure that you can keep an eye on him when he is outside and keep the can, water, or alarm handy. For dogs who are more inclined to dig, such as certain terrier breeds who had been specifically bred to dig up vermin, designate a digging spot. Put aside a certain part of your yard just for your dog. Encourage him to dig in that spot and discourage him from digging in others with chicken wire or a pet deterrent spray. You can bury fun things in his designated digging spot. Bury treats, bones, toys and any other fun doggy things you can think of. As you can see, a dog who digs out of boredom or to cool down may have a simple fix. But dogs who dig out of instinct may be more difficult to train. To keep your dog from digging may take a lot of TPPC. TPPC is Time, Patience, Positive Reinforcement, and Consistency. Remember that nothing good ever comes easy and there is nothing better than a good dog. “Dogs I Have Met and the People They Found” by Ken Foster is in a way one story, but in another way many stories. It is one story in that it is Ken’s experience. It is also one story in that he talks about his own dogs, especially his pit bull mix named Brando. It is many stories in that Ken talks about many special dogs he has met and that he shares stories which his fans have written him about their own beloved dogs. One story which he shares is about a puppy who was literally discarded by his previous owners. The poor puppy was tossed out of a moving vehicle and severely injured. He would have surely died a slow and painful death if he had not been rescued by a passerby. Jessica was the one who rescued him. She had very little money of her own but didn’t give up. She managed to rally a town to help her with vet bills and adopted the dog for her very own. He is now probably one of the happiest dogs in the world – and the luckiest. Ken Foster has done a lot of traveling and has met a lot of dogs. The second chapter of his book is about his experience with dogs and dog people in Costa Rica. Some other chapters are about his experience with dogs in New Orleans just after Hurricane Katrina. He also talks about a dog with a rare disease and a loveable pit bull named Jimmy. I keep saying stories, but the word story sort of implies that the stories are made up. Ken’s stories are true. He doesn’t write in story form. He writes as if writing in journal. He doesn’t embellish with fancy words and prose. His writing is raw and real. The letters people have written him are real. The dogs he has met are actual dogs and so are the people they found. 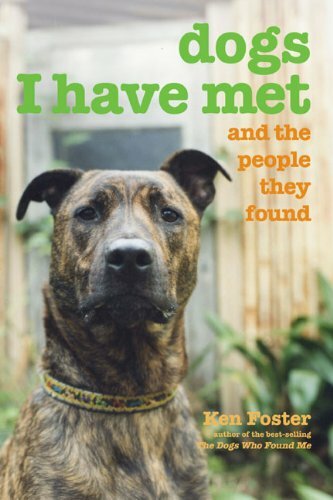 You can find his book, “Dogs I Have Met and the People They Found”, at Amazon.com or you can visit our Amazon a-Store at http://astore.amazon.com/petautsaf-20.